Once in awhile at clubs or parties, DJs will throw out a “salsita” to pick up the mood, to show diversity in his or her repertoire, or simply to welcome all of the Latinos to the event. Upon hearing the first caribbean rhythms, everybody (whether Latino or not) begins to uncontrollably move their feet, almost as if wanting to stomp out a cigarette, and swaying their heads, as if they were repeatedly saying yes. 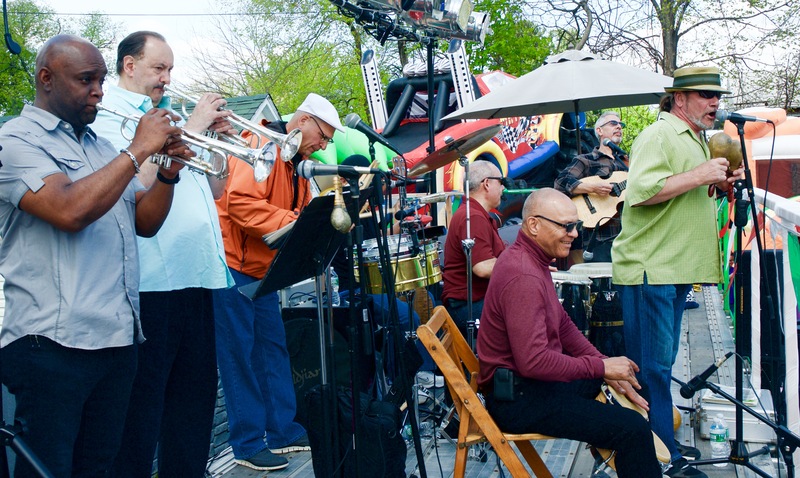 But, when the voices and instruments of these rhythms are heard live from Soñando, the best salsa band of the Hudson Valley, all of the good dancers step onto the dancefloor, like humans that are possessed by simply the pleasure of being. These dancers already have a date with Soñando for July 24 iat the Spiegeltent at Bard College. Only this time, the dancers don’t just go to dance for the pure pleasure of dancing, but to support La Voz, the only spanish magazine of the Hudson Valley. This La Voz party, where there will be food and drink for sale, also includes a silent auction of Latin American art and objects, organized by the Pritzker Studio and Gallery. And for those who would like to learn a few steps, Maia Martínez and David Salvatierra of Dojo Dance Company will teach everyone a mini salsa dance class to start the party with DJ Santiago Sánchez El Juez. Recently, Rubén Quintero the main singer and founder of the band, spoke about the extensive trajectory of Soñando. In fact, seeing Soñando live these days, is considered above all a privilege, since the band only does around 10 performances a year, in comparison with the 300 that they usually did in the past. Many would agree that Soñando is like a good wine, it gets better with age. This is not because the band doesn’t want to play anymore, but that their musical activity has been minimized due to the prevailing economic crisis. Quintero, who has both Colombian and Puerto-Rican roots, affirms that in this day, the options for the endless amounts of musical groups in the valley becomes less each year. Many establishments or private parties don’t hire live bands anymore because it is much cheaper to contract a DJ. It’s not to say that Soñando, whom have participated in the Puerto Rican Parade in NYC, appeared on TV, recorded CDs, and have played along side of Tito Puente and Carlos Santana, aren’t flexible when it comes to hiring. Especially if the money from the event is collected for a cause or segment of the community, like in this case of La Voz (located at Bard College, a 501c3 non-profit organization). And although it may seem like the great dancers of the past are disappearing, it’s the band with the trumpets, strings, keys, percussions, and voices that still manages to light fire on the dancefloor. Soñando will not let this tradition die because they have been keeping it going for the past four decades. With Antonio Vélez on the guitar, Harry Justiniano on the bass, Pito Castillo on the congos, Ernesto Colon on the drums, Samuel Dandiádes on the bongos, Luis Pérez and Larry Moses on the trumpets and Rubén Quintero as the main singer, Soñando is prepared to bring their best repertoire of sounds, plena, merengue and salsa to the Fiesta of La Voz. When: Sunday, July 24 at 6PM. Buy your tickets online here, or call the Box Office at 845-758-7900. Thanks to the sponsors of this event: ABC Latino, Alzheimer’s Association Hudson Valley, Dutchess Community College, MVP Health Care, Walter Sierra and Erie Insurance.